This web site has been developed under the project "Marking of Tourist Facilities in Euroregion" (SPF/PL/2009/42). The project is implemented under Objective 3: The European Territorial Cooperation Cross-Border Cooperation Programme Lithuania-Poland to support sustainable development of the border areas of Lithuania and Poland, by improvement of their economic, social and territorial cohesion. 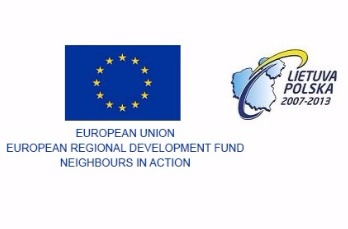 The program is partially financed by the European Regional Development Fund.